U of T, as with any university, is a space for peaceful discussion and debate, where all are entitled to their opinions. However, opinions must be justified by fact in order to become well-informed judgements. I tend to believe that historian Efraim Karsh, a founding director of the Middle East & Mediterranean Studies postgraduate program at King’s College London, was qualified to offer a well-informed judgment at his U of T lecture last month. When, just for once, a visiting professor voices a well-founded yet unpopular finding, we should take it as a new viewpoint — or at the very least a criticism — and avoid calling for his denunciation. The facts Karsh that put forward are actually plain and simple. Palestinian leadership has proven to be notoriously difficult to work with throughout history. Until the early 1990s, the Palestinian Liberation Organization (PLO) did not even acknowledge the right to existence of the State of Israel, resorting to conflict by default. When negotiations started in Oslo — for which Yasser Arafat, PLO Chairman and first President of the newly formed Palestinian National Authority, even got a Nobel Prize — the Palestinians were granted autonomy. And yet Palestinian authorities have rejected any peace offer made by Israeli governments ever since — including an offer involving regions of East Jerusalem in the 2000 Camp David accords. As unpopular as the opinion may be, Israel and Palestine have not been at war for seven decades, as the author suggests. Rather, it started as a conflict between Jewish and Arab states that began with a unanimous Arab rejection of the United Nations Partition Plan of 1947. The conflict with a self-identifying Palestinian group began taking its current form in the mid-1970s, following countless terror attacks carried out by the newly formed PLO, which is still in control of the autonomous Palestinian Authority and the Popular Front for Liberation of Palestine. Israeli governments still negotiate with these organizations, despite their implicit intent to bring Israel to its destruction. The author’s advocacy for the Boycott, Divestment, Sanctions (BDS) movement is extremely problematic. BDS aims to boycott the State of Israel, but doing so is a form of modern antisemitism as it serves to prevent notable Israelis from success in academia, arts, and culture. Coupled with its known ties to the PLO and lack of condemnation toward Hamas — the terrorist organization running the Gaza Strip and whose charter calls for the destruction of the State of Israel — the idea of giving BDS official university sponsorship under the guise of free speech is worrying. Two sides are in a deadlock, and the conflict will only change with a change of leadership on both ends. There is need for a committed, confident, peace-seeking leader who skillfully navigates the difficult Israeli public space, and a democratically elected leader on the Palestinian side, unaffiliated with organizations openly calling for its negotiating partner’s destruction. The author has a right to disagree with and reject Karsh’s presentation. After all, Karsh presents an Israeli-centric view, more favourable than others seen in the media. Calling for a condemnation and apology from the university, and a following condemnation of a whole state, however, is not reasonable. In her article “Who speaks for Palestine?”, Lina Lashin argues that the stated goals of the Boycott, Divestment, Sanctions (BDS) movement are misinterpreted as targeting Israeli and Jewish identities. Whether or not its political objectives are antisemitic, BDS is antisemitic in its effect, if not in its intent. Although BDS activists paint the movement as a peaceful one that solely seeks to promote fundamental rights using economic pressures, this remains to be seen. BDS emerged during the Second Intifada, a violent resistance movement that predominantly involved wearing explosive-rigged suicide vests and detonating in crowded Israeli civilian areas including pizzerias and cafés. Israeli civilians were murdered in terror attacks on an almost daily basis, and fearful for our safety, my own family immigrated to Canada. This is the same intifada that fuelled anti-Israel advocates on university campuses. In 2015, the “Stabbing Intifada” wave of violence was supported by the #SolidarityWaveBDS hashtag. Worryingly, Western student activists were using the same hashtags for the same cause. Omar Barghouti, the Palestinian founder and chief proponent of BDS, does not shy away from admitting the real ambition of BDS: the destruction of Israel. In 2009, Barghouti told the anti-Israel online publication The Electronic Intifada that “people fighting for refugee rights like I am… cannot reconcile the right of return for refugees with a two-state solution… a return for refugees would end Israel’s existence as a Jewish state.” That year, Barghouti also repeated this position to a group of students at the University of Ottawa. Lashin and her fellow BDS advocates refer to themselves as proud anti-Zionists, but never antisemites. To most on this campus, antisemitism is untoward, justly put in the same category as racism, sexism, and hatred towards the LGBTQ2I+ community. Ignoring the deeply entrenched antisemitism involved in anti-Zionist BDS, Lashin argues that free speech is not applied equally at U of T, and that the University of Toronto stifles pro-Palestinian advocacy. Yet just this month, the U of T Faculty of Law hosted well-known Palestinian law advocate and United Nations Special Rapporteur Michael Lynk to discuss the intersections of Palestinians, Indigenous people, and British common law. Moreover, the University of Toronto’s Graduate Students’ Union has spent thousands of student dollars on BDS activities. The Israeli–Palestinian Conflict is a multilayered, complex issue with human beings on either side, and thus requires empathetic communication and space for difficult cross-dialogue. There is ample room at U of T for discussions on Israel and Palestine. But BDS, and other movements like it, are never helpful and only further the divisiveness on campus. They entrench opposing viewpoints and create division, are openly anti-peace, and are a poor use of student dollars and student union time. Disclosure: Arik Portnov is a contributing producer for the Bazaar podcast by The Varsity. This year, Israel and Palestine have entered their seventh decade at war. As one of the world’s most conspicuous international conflicts, opinions on the subject vary widely among both scholars and observers, and everyone is entitled to speak freely, engage in dialogue, and offer roadmaps to peace. With this in mind, every debate, if it is to effect meaningful change, must provide a fair voice for all sides, and, more importantly, outline reasonable limits to drown out the extremes. But that wasn’t the case on January 17, when U of T welcomed Israeli-British historian Efraim Karsh to deliver a lecture entitled “Back to Basic: Rethinking the Arab-Israeli Conflict” at Seeley Hall. Even though the event was co-sponsored by U of T’s prestigious International Relations (IR) program, my expectations of respectful and constructive academic discourse that would subject neither Palestinians nor Israelis to offence did not come to fruition. The views that Karsh expressed reflected anti-Palestinian racism, and the U of T organizers of the lecture remained, and continue to remain, silent and therefore complicit with the issue. In the lecture, Karsh indicated that the Israeli–Palestinian conflict was self-inflicted by Palestine. This was not surprising. After all, the event’s description foreshadowed Karsh’s problematic view that the Palestinian Arab leadership is to blame for the current lack of Palestinian statehood. Karsh did not opt to provide a middle ground argument either, failing to hold Israel accountable for its actions. Beyond this one-sided view, Karsh went to the extreme of ascribing saviourism and patronage to a state that has subjected Palestinians to decades of illegal occupation, settlements, expulsions, mass murders, and bombings. This is not a controversial description — the international community has consistently criticized Israel’s occupation. In sum, Karsh excused the violence in and justified the colonization of Palestine. When The Varsity contacted Karsh for clarification on his “benefit” comment, he pointed to the socioeconomic development in the region during the interwar period and prior to Israel’s creation. But Karsh’s previous comments, such as in a 2017 interview with YouTube channel J-TV, point to his belief that Palestinian Arabs also benefitted, at least regarding life expectancy increases, under the existence of Israel in the decades following World War II. The creation of Israel resulted in the expulsion and flight of 700,000 Palestinians from their homeland in the first year of the conflict alone. Karsh failed to explain how this supposedly beneficial interwar period was relevant in light of the history of the occupation that has devastated the Palestinian people. While the origin of Palestinian identity is subject to considerable historiographical debate, Karsh’s description of Palestinians as an “invented people” is a racist trope designed to reduce the gravity of, and even justify, Israel’s treatment of Palestine. Denying the identity of the Palestinian people is to deny the legitimacy of their grievances as an occupied people. If there is no legitimate ‘ethnicity’ to begin with, then the ethnic cleansing that Palestinians have experienced did not happen. Today, Palestinians embrace their national identity as a mode of claiming their homeland and resisting Israel’s occupation. While all nations are indeed constructed, they become real to the people who identify with them. If Palestine is to be called invented, then so should Israel, Canada, and every other nation-state. To selectively focus on Palestinian identity is to justify political imperatives, namely colonization and ethnic cleansing. Although Karsh did not recognize this claim at all in his comments to The Varsity, multiple sources present at the lecture independently corroborated the statement. In my view, what Karsh implied with this claim is that a unified Palestine is an inherent terrorist threat to Israel. Ultimately, Karsh’s reading of history overlooks and correspondingly justifies Israel’s past and present actions against Palestine. In light of U of T welcoming such views, it is worth considering whether Karsh’s lecture is an isolated and unusual incident on our campus or not. This is certainly not the first time that a speaker with such extreme views on the conflict has been welcomed on campus. In 2005, controversial US scholar of the Middle East Daniel Pipes was invited, despite backlash and protest from students. Academics and students refused to give Pipes a platform for what they called “hate, prejudice and fear-mongering” on campus, but ultimately, his ‘free speech’ argument won and he was able to speak. Meanwhile, U of T itself has a history of limiting free speech when it comes to pro-Palestinian advocacy. This is especially the case for Boycott, Divestment, Sanctions (BDS) groups on campus, as argued in a 2009 article by activist Liisa Schofield. Schofield argues that the administration engages in active opposition to pro-Palestinian activism. Although BDS is a peaceful human rights movement that seeks to use economic means to pressure the Israeli state to comply with international law, similar to past calls for the boycott of apartheid South Africa, it is frequently misconstrued and conflated with antisemitism. Just last month, at a town hall at Brock University, Prime Minister Justin Trudeau defended his November parliamentary condemnation of the BDS movement, in which he associated it with the kind of antisemitism that saw Canada turn away Jewish refugees from Nazi Germany. This is unsurprising — Trudeau has been criticized before for his government’s silence on Israel’s atrocities in Palestine. In other words, BDS is misinterpreted as targeting Israeli and Jewish identities. But BDS has actual political objectives, such as ending the occupation of Palestine. BDS supporters have not even been allowed to make their case through these committees, however, and the university continues to invest in companies that are complicit in illegal Israeli activities in Palestine. In a HuffPost article, U of T student Alex Verman notes the ways in which pro-Palestinian activism is being intimidated and silenced by our governments. They also point to well-financed and organized pro-Israeli groups, like StandWithUs, that have harassed pro-Palestinian students and staff. The point is that, if our universities and governments are so invested in the Israeli state, it should be of no surprise that free speech on campus regarding the conflict doesn’t apply fairly across the board. While pro-Palestinian BDS advocacy is dismissed as racist, pro-Israeli speakers who distort history and justify Israel’s widely condemned actions against Palestine are welcomed, whether in 2005 or 2019. Prior to the current conflict, Jewish and Muslim citizens lived in Palestine for centuries in peace. But Karsh, and those who echo his anti-Palestinian sentiments, serve to widen the divide between these peoples. Following Karsh’s lecture, I contacted organizers of the event expressing my shock and anger toward his views, and demanded recognition for the offensive content of the lecture and a publication of a letter of apology. It is clear that hate speech is being confused for freedom of speech and diversity of thought. The purported objective of Karsh’s lecture was to bring light to an issue of importance. Instead, the Palestinian identity was degraded. The event organizers could have demonstrated real ‘diversity’ if they had hosted panelists with other views or invited a moderator to question and challenge Karsh. Instead, Karsh was given an unrestricted platform at the expense of the well-being and security of students for whom Palestine carries deep meaning. I have not heard any substantive follow-up feedback from Kirton in our correspondence, and given the history of U of T’s responses to similar concerns, I am sadly not anticipating any either. Nonetheless, I have mobilized the support of over 100 Ontario students who now await U of T’s response to this issue. The university should consider implementing an outline of clear limitations on advocacy around the Israeli–Palestinian conflict. Just as justifying violence against Palestinians should not be allowed, Israeli and Jewish students should be protected from racial and religious discrimination too. But this cannot be conflated with political criticism of Israel’s illegal occupation and treatment of Palestine. Freedom comes with responsibility. U of T must carefully assess the content of speeches that take place with its endorsement and apply a vetting policy for guest speakers accordingly. If we support a kind of free speech that enables attacks on already marginalized identities, then whose freedoms are we even fighting for? Lina Lashin is a first-year Social Sciences student at New College. Editor’s Note: Because Karsh contested almost every claim in Lashin’s account of his lecture, Karsh’s responses have been included in this article. Multiple sources who attended the lecture independently corroborated Lashin’s account to Varsity editors. Three students have filed grievances against the University of Toronto Students’ Union (UTSU) vice president, equity Sania Khan relating to her work in support of the Boycott, Divestment, and Sanctions (BDS) movement. The complaints were filed after the Social Justice & Equity (SJE) Commission hosted an event that discussed ways to build solidarity with Palestine during eXpression Against Oppression (XAO) week in 2015. “Throughout the course of this past year, it has become growingly evident that students and faculty members on the U of T campus are no longer choosing to remain inactive toward U of T’s complicity of human rights and international law violations in Palestine,” Khan said of the reasoning for holding such events. Khan highlighted the numerous faculty signatures endorsing the University of Toronto Graduate Students’ Union’s BDS efforts, the popularity of the XAO event, and the unanimous vote in favour of signing a letter of support for Al Quds University students at a recent SJE commission meeting, as evidence for this support. “As students whose tuition money is consequently being invested in Israel’s military occupation of Palestine, we have a moral responsibility to hold the university administration accountable until they fully divest from the companies sustaining the occupation,” Khan said. According to Khan, BDS is a campaign rooted in upholding human rights and international law. “People of conscience from all religious and non-religious affiliations have chosen to support BDS because of its focus on securing Palestinian human rights, and this is something we here in Canada have a responsibility to work toward,” Khan said, adding that Independent Jewish Voices at U of T has endorsed the BDS movement. First-year law student Aidan Fishman and fourth-year Victoria College student Mitchell Gould filed two separate grievances against Khan in November 2015. Both were filed in response to an XAO event called Solidarity with Palestine — Building the Student Movement. Gould told The Varsity he posted on the Facebook event page requesting that UTSU release a statement acknowledging incidents of violence against Israeli civilians. He also alleged that he was blocked from posting on the Facebook page. The event included a screening of the documentary Roadmap to Apartheid and an open discussion. In his grievance, Fishman stated that he wanted the event to be cancelled or that the UTSU stop funding or sponsoring it. He also requested a letter of apology from Khan. Fishman claimed that the film was anti-Semitic and alleged that the event violated the union’s by-laws on the grounds that it was not discussed at a meeting of the SJE commission. He further claimed that an endorsement of BDS in and of itself is a violation of the UTSU’s by-laws, as well as its mission statement, which includes a commitment to safeguarding the rights of all students, regardless of nationality. 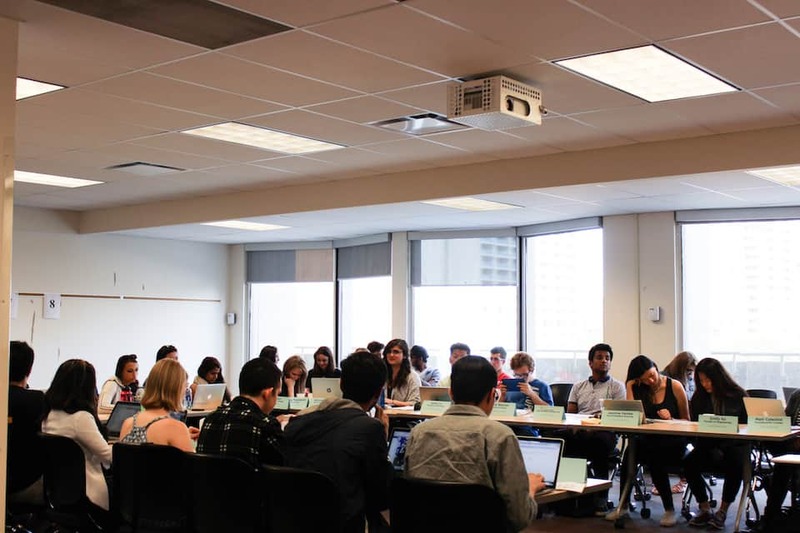 The UTSU’s Executive Review Committee addressed Fishman’s grievance at a meeting on November 11. The committee recommended that the SJE commission discuss and approve any and all events run by the vice president, equity. This recommendation was forwarded to the UTSU’s Board of Directors, which defeated the motion. Khan told The Varsity that she finds the tactics that anti-BDS groups deploy to be highly problematic. Anti-BDS groups often interrupt BDS events; members of the Jewish Defence League disrupted a panel in January that focused on how students could show solidarity with Palestine. Khan believes that the disruptions are an attempt to shut down debate and discussion about the topic. “‘Feelings’ of discomfort about BDS are used as a way to deliberately shift the conversation away from the facts on the ground, namely the violations of human rights and international law committed by Israel against Palestinians,” she said. Reut Cohen, a first-year Trinity College student, filed a grievance in late December regarding a letter published by U of T Divest and Students Against Israeli Apartheid (SAIA) supporting Palestinian popular resistance. Among the 28 signatories of the letter is the UTSU Social Justice & Equity Commission. The letter expresses support for Palestinian resistance, which Cohen believes indicates support for violence against Israeli civilians. Khan said that reading BDS as an endorsement of violence against Israeli people is a misrepresentation intended to discredit the movement by avoiding the demands of BDS: to end the Israeli occupation of Palestinian land, grant equal rights to all Palestinians inside Israel, and to respect the right of return for Palestinian refugees. “These demands are powerful because they are all guaranteed under international law. To accuse BDS as something else is a deliberate attempt to avoid the key demands on which BDS is built,” Khan said. Cohen’s grievance also demands that Khan discontinue engaging with BDS without the approval of the Board of Directors. In response to the demand that Khan cease her work on promoting BDS on campus, Khan told The Varsity that the mandate of the vice president, equity “includes a commitment toward anti-oppression, anti-discrimination, and anti-racism work,” and that supporting Palestinian resistance against Israeli apartheid fulfils that mandate. Khan stated that she would not discontinue work that is required by her position. Fishman, Gould, and Cohen have not received a response from Khan and have not had a meeting with her and the grievance officer, which is required under UTSU’s by-laws. The resolutions suggested in the grievances include a public apology for the work Khan has done and continues to do in support of Palestinian resistance and the withdrawal of funds from collaborative efforts with student organizers committed to Palestinian resistance work. In light of these demands, Khan said that her refusal to acknowledge the grievances was intentional. “I will not entertain any ‘proposals,’ ‘meetings,’ or ‘resolutions’ put forward by any student who suggests that I stop the work being done against Israeli apartheid. The position of vice president equity in fact requires that I continue this work,” Khan said. All three grievances are expected to be addressed at a board meeting later this month. Disclosure: Reut Cohen is an associate arts and culture editor for The Varsity.